After an unintentional three-year hiatus from spending any significant time in NYC, husband and I had an adventurous Memorial Day weekend in which we spent one day in Orange County, half a day in Westchester County and 2.5 days in the city. We ate such an incredible amount of food during that time that I have decided to split it into three separate blog posts, because otherwise it would be far too long. This is part one – the dessert tour. The first stop was the Levain Bakery, home of delicious cookies. We sampled the chocolate peanut butter cookie (pictured) and their famous chocolate chip walnut cookie. Since we got there before 11am, the cookies were super fresh. The chips in the chocolate chip walnut cookie were melty and gooey… mmmm. This is a place that I’ve determined must be returned to for a more thorough taste test. At Bouchon Bakery, we ate re-imagined childhood favorites. On the left is an Oh Oh, a chocolate cake with vanilla filling. 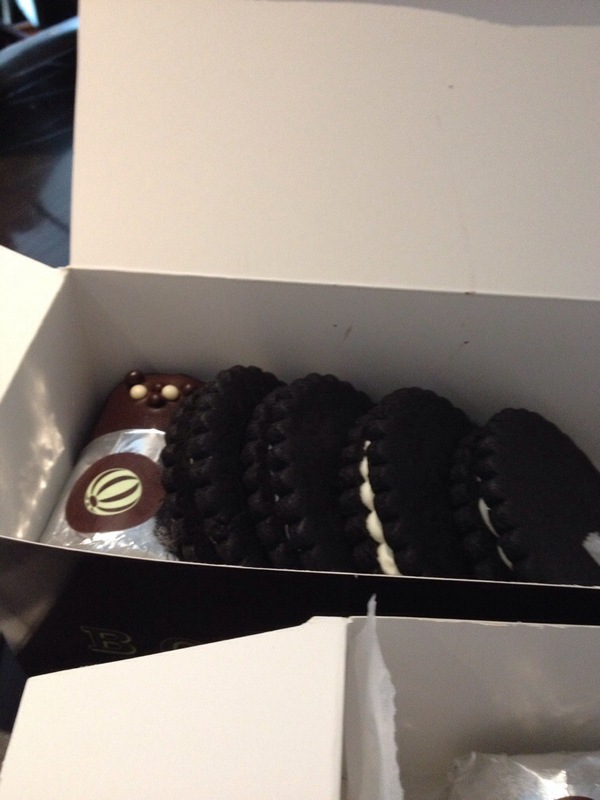 On the right we have the TKO, which is a chocolate sandwich cookie with vanilla cream. Sound familiar? The Oh Oh was good, but the real winner here was the TKO, which tasted like an Oreo x1000000. These are no ordinary doughnuts. Truly, there is no such thing at the Doughnut Plant, where innovation is showcased. Their filled doughnuts are square so that the filling is throughout the pastry, not just in the middle. How genius is that? This is a place that Laura had taken me to on my last trip to the city, and it was just as enjoyable the second time as the first. On the left is the mango glazed doughnut, which I was happy to find had a subtle but flavorful mango taste. On the right is the tres leches doughnut, which I can only describe as delicious. I could have easily eaten one of those whole ones myself. Jacques Torres was the other location on the tour that I’d been to in the past, although this was the first time I’d sampled his chocolates. That sounds strange because he’s a chocolatier, but he also happens to have delicious ice cream sandwiches. But on this occasion, chocolate was consumed. Husband had a peanut butter chocolate, and mine was filled with rum caramel. I admit that I prefer my caramel sans booze, although no real complaints. But I think I’ll skip the chocolates next time in favor of his other treats. If you recognize the name Dominique Ansel, it’s because he’s the man responsible for the cronut. We got to the bakery hours too late to get one of those, but we did manage to snag some DKAs – Dominique’s Kouign Amann. The DKA is also reminiscent of a croissant, with the same flaky, buttery layers of pastry. However, it had a definite sweetness to it, making it a dessert rather than a breakfast food. Maybe one day I’ll get up at the crack of dawn for a cronut, but in the meantime I recommend the DKA. I don’t know why I didn’t take pictures of everything we ate that day, but I didn’t. The cupcake on the left is the one I tasted from Sugar Sweet Sunshine – the pistachio. I needed to taste that rather than the pumpkin because while I have both made and eaten plenty of pumpkin baked goods in my life, I don’t think I’ve ever sampled something pistachio-flavored. I didn’t know quite what to expect when I bit into the decidedly green cupcake, but my taste buds were happy. The cake itself was soft with just the right amount of crumb (I suspect cake flour rather than AP flour, or maybe both), and there was a definite pistachio flavor, but not enough to be off-putting. The vanilla buttercream offset the flavor nicely. I think more pistachio would have been overwhelming. I may have to try making a version of this myself! You really can’t go wrong with gelato. And at this place, you can get pretty much any flavor you can think of! Although they only have 48 available at any given time, their flavor repertoire is over 300. The three flavors that we sampled were basil, cheesecake, and pomegranate. The basil tasted like pesto ice cream. Good for a lick, but I could never eat a whole serving. The cheesecake was very good. I think cheesecake ice creams are often very sweet, forgetting about the slight tartness that the cake gives. But this time, it had a nice balance and it really tasted like cheesecake! But the winner was the pomegranate. 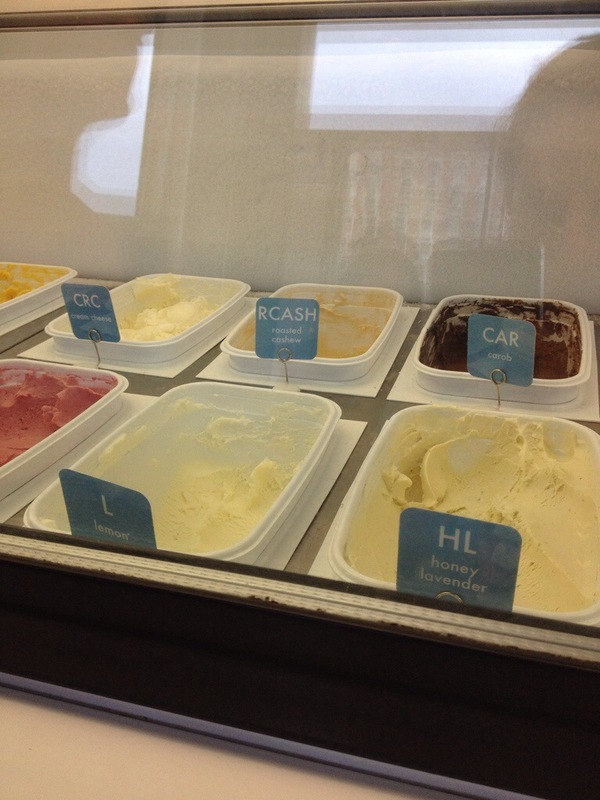 Maybe it was because the gelato was a nice change from all the pastry, but I found this flavor to be very refreshing. Fruit flavors tend to be found in sorbet rather than ice cream, and I think that’s a mistake! First of all, Chikalicious is fun to say. Second, the vanilla mille crepe cake is like nothing I had ever tasted before. It may look like a solid cake, but all those layers are so light that you could easily think you were just eating whipped cream with a fork. This is the type of cake that’s impossible to take only one (or two) bites of. Fortunately, there were plenty of people with forks, so this disappeared quickly. 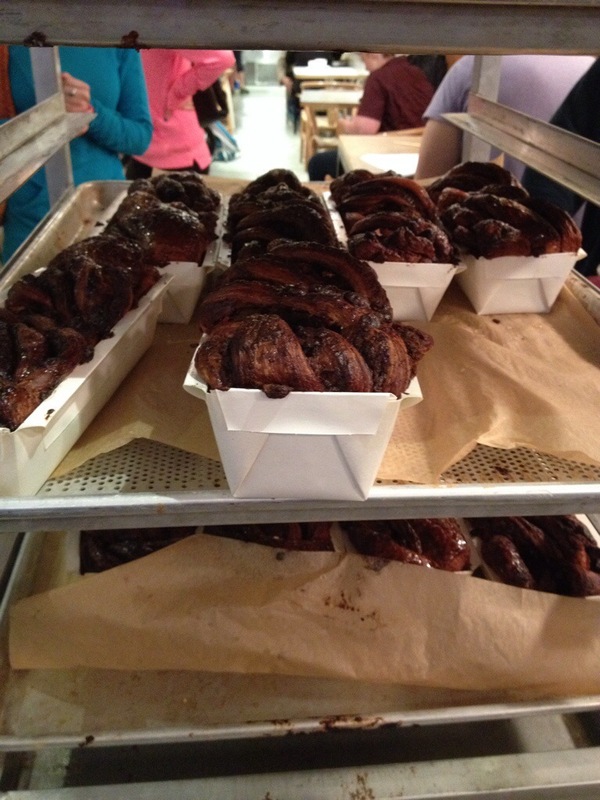 The last stop was for the above treat – chocolate babka. This is a traditional Jewish food that I’ve eaten as both breakfast and dessert in my life. Although good, this was not the best babka I’ve had in my life. This version was more bread-like and less pastry-like, plus it lacked the crumb topping, which is my favorite part. I preferred the mascarpone babka, which I found to be lighter than its chocolate counterpart. We also got a surprise taste of marzipan rugelach, as the bakery was putting out samples as we arrived. At first I thought they were rugelach from Marzipan, which is a bakery in Jerusalem that makes incredible chocolate rugelach. Sadly, they were not, but delicious nonetheless. Phew! That was a lot of dessert. Fortunately, it was also 10 miles of walking! Lunch and dinner were also included that day, but they don’t quite fit the theme of this blog, so I left them out. Coming in part two – all the other desserts we ate that weekend!